Jeppesen and Etihad Airways, the national carrier of the United Arab Emirates, have agreed to a long term service contract that will provide the fast-growing airline with paper and electronic charting and Jeppesen FliteDeck Pro electronic flight bag (EFB) applications to establish an integrated flight operations solution. Abu Dhabi-based Etihad will receive Jeppesen’s industry-leading charting navigation solutions through the agreement. The agreement includes paper charting and access to Jeppesen eLink Online which provides web-based updated electronic terminal charts, documentation and other vital flight information. 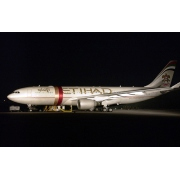 Etihad Airways operates a fleet of 57 commercial aircraft and operates more than 1000 flights weekly. Etihad Airways serves an international network of 66 destinations in 42 countries. For more information on the industry-leading FliteDeck Pro electronic flight bag solutions provided by Jeppesen, please visit www.jeppesen.com/efb-FliteDeckPro.